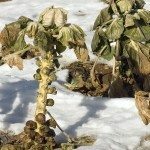 Are the big leaves on brussel sprout stalks edible? This is my first garden. My brussel sprouts have large leaves growing out from the stalk. The sprouts are attached to the stalk. Are the big leaves OK to eat? Yes, they are edible. If you google "brussel sprout leaves" you'll find lots of recipes.